Credits to Brutaka from the Serebii.Net Forums for the awesome banner! 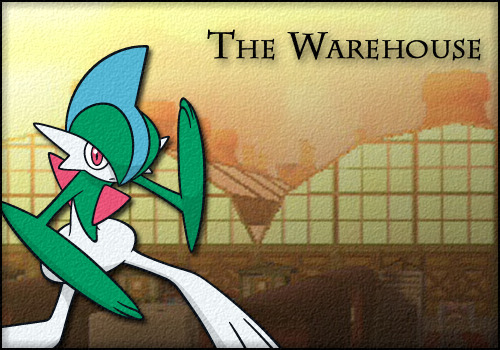 Welcome to The Warehouse! Owned by Nexus, this is the place to go for miscellaneous Pokémon! I have over 2000 specials for sale, those being a mix of Shinies, Metals, Ghosts and Darks. All specials vary in rarity, and they can be found in the Gallery/Tradeslist of Free_Legy_Yard. Please note: If you have something I'm buying, you MUST give me an idea of what you would like in return, whether it be an amount of cash or specials, a combination of both, etc. Voids for under 10m that I need! Please also note that I am NOT listing all of the Shinies, Metals, Ghosts and Darks I have for sale, as there is unfortunately a character limit on these forum posts. Please contact me via one of the methods mentioned at the bottom of my wants list if you want to know if I have specific ones. I can also get pretty much any Non-Special Pokémon to sell to you (not in bulk), so just contact me stating what you want and I'll see if I can get it (ignoring most fakemon, credit-only 'mons, uber-rares and unobs). This list is subject to change over time, so check back frequently! Last edited by theashman83 on Sun Apr 13, 2014 11:31 am, edited 29 times in total. Hey bro, I posted on your profile about shiny piplup, but I also have 2 shiny beldum if you want. Just tell me your price. Is 10m for the 3 alright? That works out at 2*3.5 (Beldums) + 3 (Piplup) = 10m. Ash pay me 3mil each for these two. Offered. Let me know when you accept please. theashman83 wrote: Is 10m for the 3 alright? That works out at 2*3.5 (Beldums) + 3 (Piplup) = 10m. Hi ash !shiny togekiss 1.5 mil? sayeedjabri79 wrote: Hi ash !shiny togekiss 1.5 mil? Sure. Go offer on my trades, it's already up. Last edited by Firefist_Shaaif on Fri Jan 24, 2014 6:02 pm, edited 1 time in total. Awesome. Is it on your trades already? Last edited by theashman83 on Fri Jan 24, 2014 6:09 pm, edited 1 time in total.